The Open Society Foundation for South Africa (OSF-SA) was founded in 1993 and its history is closely linked to the dismantling of apartheid. Fully operational by July 1993, the Foundation committed to promoting the values and practices of an open, democratic, and civil society and to working with the newly elected government to build South Africa’s new democracy. Politically, the early 1990s, were a complex, violent and contested time. The year 1994 saw South Africa’s first democratic elections and, on 9 May 1994, Nelson Mandela was elected President, after the ANC won a landslide victory. In that year too, the new national flag was launched and an interim Constitution was adopted. The team worked under the guidance of its first Board, led by Dr Frederik Van Zyl Slabbert. In his first report in 1994, Van Zyl Slabbert noted, “the Foundation sees its overall task as that of institution building for South Africa in transition. Particularly those institutions and areas related to them that sharpen the self-critical capacity of a country and assist it to be open and reflective to a dynamic and changing environment”. The Board was supported by OSF globally and through dedicated and regular visits from OSF’s leadership. In December 1994, the founder and Chair of OSF, George Soros delivered the inaugural Open Society Lecture in Johannesburg, at the Carlton Centre. 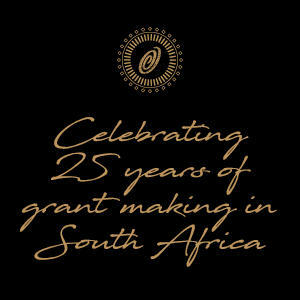 The first cohort of grantees funded in 1993 and 1994 later became some of the longest funded grantees of OSF-SA. In 1994 OSF-SA began a Community Radio Programme, starting with four new and emerging community radio stations. The first year set the tone for the future work of OSF-SA.